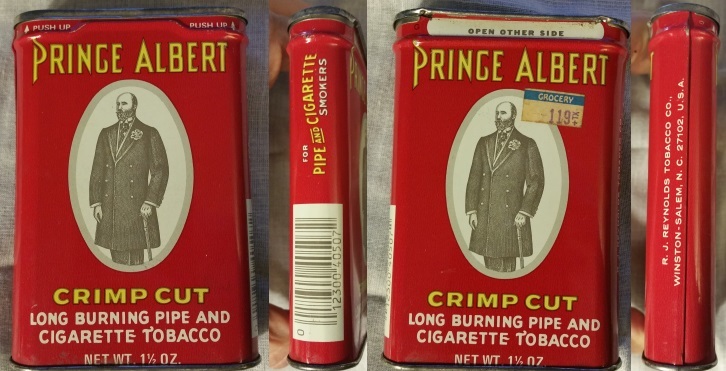 Recently I acquired 5 unopened vintage 1&1/2 ounce tins of Prince Albert still filled with tobacco. I am interested in dating them. They are in good shape with a little tarnish on the top but very clean. The tobacco inside is quite dry but still smokes OK. Well-aged, you might say. The price sticker says it originally sold for $1.19 although I do not know where - probably a grocery or drug store. As you will see from the side of the tin it was manufactured by R. J. Reynolds which puts it before 1987 when John Middleton acquired the rights to PA. On the other side is a UPC barcode which puts it after the late 1970s to early 1980s. So my guess is that this tin dates from around 1985. Can anyone get me any closer? I know nothing, other than the fact that, that is a sweet score! I wish the tins were still like that. Dump pack and light. Easy. I read the UPC code started in 1975. UPC codes became ubiquitous from 1975 and later but I have no idea when they appeared on PA tins. Maybe as early as 1975. I'm hoping some codger with a good memory can recall when this price was prevalent. I'm just curious. It still smokes good. Thank you, 3rdguy. As you suggested the UPC code was added in 1975 and Middleton became the maker in 1987. All I can say for sure is that this was manufactured sometime between those two dates. Still, if this is from 1987, that is still 32 years ago. I'd say that is well aged. Great brochure. Answers all the questions. Thanks. Glad I looked at this thread - I have an old Prince Al tin that my eldest gave me after she made a trip to an antique store. The guide helped me date my tin to the same period of 1975-1987. Thanks!